"I would have done it," said the old guy who, despite Silversea's polite dress code suggestions, pads around the ship in odd socks. "But I didn't want to." I did, though: the infamous Polar Plunge. I stripped off to my togs on the black sandy beach of Telefon Bay in Deception Island, one of the South Shetland group, and hurtled into the water, under, and out again – my fastest immersion ever. Apparently, some found the stony beach hard on their feet. I didn’t have time to notice. The water wasn’t as heart-stoppingly cold as I’d been fearing all along; and also the bit that I’d really been anxious about, getting back to the ship afterwards, was quicker and much less uncomfortable than expected. In no time at all, I was luxuriating in the jacuzzi on the rear deck, watching through the steam as the rest of the Plungers earned their (actually disappointingly boring) certificates – about 45 of us in all, a third of the passengers, amazingly. It was all about opposites today: hot and cold, black and white, volcanic and glacial. We woke to low cloud as the ship approached Neptune’s Bellows, a narrow gap in the island's flooded caldera (with, the Captain told us, a large rock lurking under the water right in the middle – fortunately the Silver Explorer didn’t do a Milford Wanderer). Inside, everything was monochrome, even more striking after yesterday’s glorious Technicolor. Geologist Wolfgang tried to communicate his wonder at things like craters, volcanic bombs and so on, but most of us just listened politely. Or maybe that was just me. The walk around the craters got more interesting when we came across a crab-eater seal, and then saw little streams of bubbles along the shore. There were patches of warm water (the volcano last erupted in 1970); also striking layers in the snow bank along the beach; and icicles. 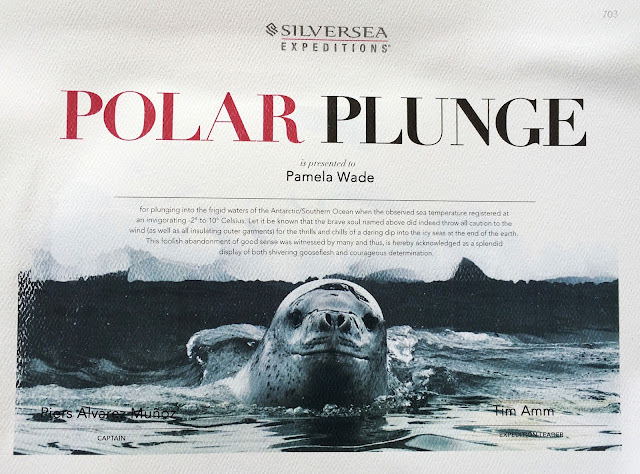 But naturally it was the Polar Plunge that really livened up the visit, with much shrieking and laughter. Afterwards, easing our way out to the open sea again, past the remains of a wrecked fishing boat that hadn’t been so careful, we headed in improving weather to Half Moon Island, which was as glamorous as yesterday’s locations. Sharp, clear mountains, big glaciers, stony beaches, red castle-like rocks, blue sea and sky, and lots of penguins. They were mostly chinstraps this time, roosting in noisy rookeries, patiently waiting for eggs to hatch or nuzzling the fluffy grey chicks that they had tucked on their feet under their bellies (not an easy thing, to transfer them from one parent to the other at the shift changeover). There was a lot of squawking going on – shouting at an opportunistic sheathbill flitting through the colony looking for a titbit, greeting a returning mate, or just joining in when a neighbour started hooting. Luke provided an interesting running commentary. It was so beautiful, and personal, and special, and such a privilege to be there to experience it all. Not many people do: so I’m really, really grateful to Silversea for enabling it. And also for doing it all so well – especially the unhurried excursions ashore, that allow the time for exactly this sort of sitting back and soaking up. Brilliant. And then, with a distinct and universal sense of reluctance, we climbed into the Zodiacs again for the last time, and returned to the ship. We ate dinner – with multiple photo op interruptions - as Antarctica’s islands receded into the distance, glamorous to the last white peak and rocky black monolith, while ahead of us lay the dreaded Drake Passage, roughest stretch of water on the planet.